Welcome to Babushkas, the world's home of Russian Nesting Dolls imported directly from the Moscow, Nizhni Novgorod and Vyatka regions in Russia. 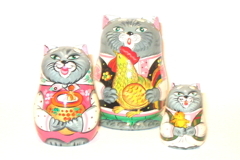 Babushkas is an import and retail business, specializing in Russian and Eastern European handcrafted products. Established by Rikki Meyer and Richard Seager in 1991 with the opening of their store in the heritage listed Royal Arcade, in Melbourne, Australia. Now, Babushkas’ offers their exceptional range of matryoshki online in the United Kingdom and New Zealand in addition to Australia. Babushkas is a retailer specialising in Russian Matryoshki. 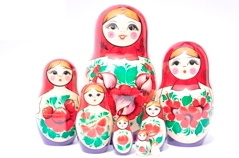 Since 1991, Babushkas has specialised in Russian and Eastern European gifts and jewellery, and we offer a range of authentic hand picked Russian nesting dolls, chess sets, Baltic Amber, Easter eggs and Christmas decorations. 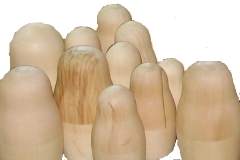 Russian Matroyshki (Nesting Dolls) are our main product line, and we are the exclusive Australian distributors for several Russian manufacturers. All of our Matroyshka come with authenticity certificates and you can be assured of the highest quality Russian Dolls, whether for a gift or to continue your collection. Babushkas has a retail store that you can visit to see the amazing range of Russian dolls available, in the Royal Arcade in Melbourne. You can also purchase online through this site, so please choose a product category to browse. Babushkas pride ourselves on our passion, service and knowledge so if you have any questions, enquires or want any further information please feel free to contact us. We have been delighting the young, and the young at heart, for over 20 years, offering our exclusive range of Matryoshki in our shop in the historic Royal Arcade, Melbourne. 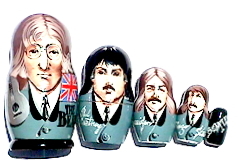 Now Babushkas is bringing the same genuine Russian Nesting Dolls to our online store in New Zealand. As we personally select and import the matryoshki, we can assure quality, authenticity and value. We are based in Dunedin, and are unique in our ability to offer personalized service with our knowledgeable staff able to answer telephone queries and fast delivery of your purchase, in most cases next day. We first opened a shop in the Royal Arcade in the centre of Melbourne in December 1991. We moved to our current Royal Arcade shop in May 1992 and have now had many successful years of trading there. The Royal Arcade is the oldest arcade in Australia and is famous as the home of Gog and Magog. Coming soon... .. .. ..